Over the centuries, European artists depicted a variety of religious figures as black, most notably one of the Three Kings, or Magi, bearing gifts for the baby Jesus. 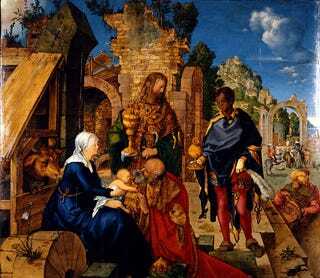 In Adoration of the Magi (1504), Albrecht Dürer subtly depicts the reception of the Three Kings by the Virgin and Child. The old king worships the Christ Child, and the middle-aged king looks toward the young black king, who in turn is focused on the scene of veneration before him. Elegant and refined, the black king stands out as a magnificent ethnic representation of the features of an African. Click here to read more about the Magi.